Quality Assurance wizards Andres Schmidt and James Kathilankal with a portable eddy covariance system. 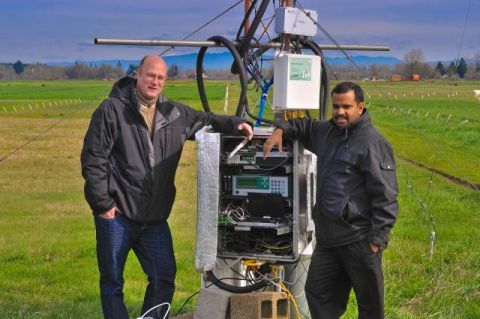 The major objective of this project is to contribute to the AmeriFlux network by continuing to build consistency in AmeriFlux measurements by addressing objectives stated in the AmeriFlux strategic plan and self evaluation, the North American Carbon Program, and the US Carbon Cycle Science Program. The project directly contributes to NACP and CCSP goals to establish an integrated, near-real time network of observations to inform climate change science. Build cohesive network of research sites to quantify and understand carbon sources and sinks and the response of terrestrial ecosystems to climate and disturbance. 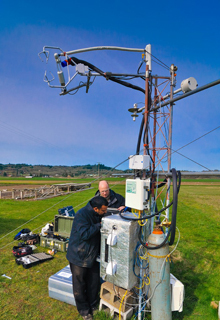 AmeriFlux is a network of 92 long-term research sites across North America measuring the exchange of water vapor, sensible heat, and carbon fluxes between the atmosphere and biosphere using the eddy covariance technique. As with every precision measurement endeavor, there are sources of systematic and random error resulting from variances in hardware, software, and the instrument installation. To reduce and quantify these uncertainties, the AmeriFlux quality assurance and quality control (QA/QC) laboratory was created to enhance data quality and ensure consistency in eddy covariance measurements within and among sites. 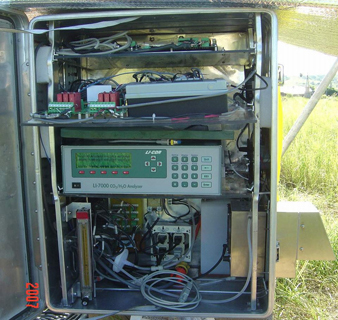 The primary activities of the AmeriFlux QA/QC laboratory involve the use of a portable eddy covariance system (PECS). This system includes all necessary hardware and software to make eddy covariance measurements as well as other meteorological data. During the active growing season the PECS is transported to selected AmeriFlux sites, set up next to the existing EC systems, and 5 days’ worth of data are collected and compared. The goal of site comparisons is to identify systematic errors due to instrument bias, malfunctioning hardware, outdated calibrations, and software. We identify errors due solely to different software routines by asking each site to process an independent raw data file developed by the Euroflux and AmeriFlux networks. Concerns regarding the installation strategy of permanent instruments may be discussed during site comparisons, but the ultimate decision on instrument configuration and site representativeness is left to the principal investigators. The specific project objectives were i) conduct 10-20 robust site comparisons each year, ii) separate uncertainties associated with site instrumentation and process software through the use of "Gold Files", iii) continually enhance and enforce the flux measurement guidelines, iv) develop and disseminate the current suite of roving standards to assist sites in maintaining internal QA/QC protocols, v) report findings to the AmeriFlux Science Chair and Steering Committee, vi) lead and develop synthesis activities across the network, vii) serve as a resource for measurement strategies among the network and other ad hoc, coordinated QA/QC activities, and viii) handle logistics of the annual AmeriFlux Meeting. In addition, we continued to address four specific recommendations made in the AmeriFlux internal evaluation report 2005 (and supported by the AmeriFlux steering committee and the TCCRP final report, Running et al. 2005): i) Provided additional roving temperature standards to each research group for calibrating their systems (High Priority); ii) provided a photosynthetic photon flux density (PPFD) sensor to each research group as a standard that is kept in the site lab, maintained annually by the AmeriFlux QA/QC lab, and maintain all calibration records in a our repository (High Priority); iii) provide all research groups not currently using the World Meteorological Organization-NOAA Global Monitoring division (WMO-GMD, formally CMDL) standards with (2) ‘archival’ CO2 standards approximately 10 ppm apart in concentration within the range of ambient concentrations, and with an ensemble uncertainty of +/- 0.12 ppm, (High Priority), and iv) explored an appropriate means to automate H2O calibrations for all IRGAs (High Priority). Our primary activity was comparison of data from the AmeriFlux portable EC system (PECS) and individual AmeriFlux/NACP sites to achieve the QA/QC goals. We prioritized selection of sites we would visit each year by i) existing sites that had not been evaluated for more than three years; ii) sites located in the mid-continental US in support of the NACP mid-continent intensive; iii) recently established sites that were initiated as part of the NACP, iv) sites where more than three years have passed since the last comparison. We made the NACP regional projects a high priority to ensure coherency of flux site data quality within each region and reduce uncertainty in the synthesis of flux and meteorological data within each region. Our instruments were calibrated in our QA lab between the site visits. We derived our own IRGA polynomials rather than use those provided by Li-Cor, which helped us to achieve higher accuracy and precision (see Ocheltree 2007 for a detailed description). To ensure rapid turnaround of each comparison report, we informed PIs that we will only visit sites that agree a priori to provide data within two weeks of the site visit. We also encouraged the PIs to provide processed data while the site visit was underway to allow us to perform preliminary analyses. This improved the quality and amount of data we had available for analysis after the site visit. We communicate directly with individual site PIs through the process of evaluating their data quality, and iterate until we feel they address issues we found with their measurements or data processing. General communication with AmeriFlux investigators is conducted through the AmeriFlux list server, conferences and development of web-based materials for the AmeriFlux web site at Oak Ridge National Lab. Since August 2002, the FS portable EC system has been used for site intercomparisons. 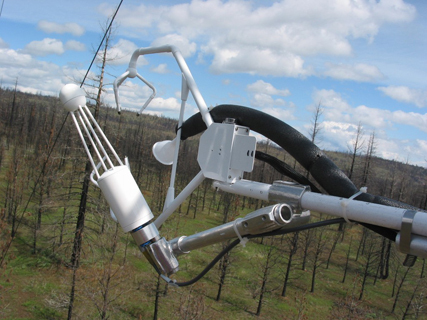 The portable eddy covariance systems (PECS) were redesigned by C. Hanson in 2008. Changes include improved temperature control, system diagnostics and a remote data link. Performance and reliability of the new PECS are significantly improved over the old system. The previous QA/QC PI used a canned data processing program, EdiRe, but the program was not flexible enough to deal with different data processing needs for robust site comparisons. C. Thomas (Asst. Prof. at OSU) developed Matlab data processing software (TerraFlux_process.m) that is much more flexible and consistent with QA standards in Carbo-Europe. J. Kathilankal, our current QA post-doc, modified the Matlab software in 2009-2010 to include new corrections and options. The program now incorporates corrections for spectral attenuation for line averaging, block averaging and tube attenuation (for closed path IRGA), based on the analytical method of Massman (2000). It also incorporates options for using a constant pressure in flux calculations. The modified program was tested against the gold-file outputs from EdiRe under specific conditions and results indicated differences less than 5 percent. The program is fully tested and is in use for all site comparisons. Systematic errors between those from instrumentation and software routines can be identified through the comparisons of the AmeriFlux standards and individual sites using the same, independent raw data file, i.e., Gold-file. Gold-file data sets and instructions for both closed-path and open-path IRGAs were updated in 2009. AmeriFlux sites have used the closed-path and open-path ‘Gold-files,’ respectively (~50 percent of the research groups). Many research groups outside AmeriFlux are also using our Gold-files to standardize their data process procedures (e.g. Japan, Canada, Argentina). Temperature standards. We recalibrate our four temperature standards annually and send them to sites on demand. Our temperature standards have agreed well with observations by NOAA’s calibration facility (Oak Ridge, TN); the differences were less than 0.1 deg. C. Our temperature standards have visited 12 sites with observed differences between site- and our sensors ranging from 0 to 3.2 deg C. This has improved quality of air temperature measurements at sites. Photosynthetic Photon Flux Density (PPFD) and new AmeriFlux PPFD sensors. High quality PPFD measurements are critical for data comparability in synthesis efforts, and for NACP and global modeling activities. PPFD sensors (LiCor 190 series) have been notorious for degradation and drift, and do not calibrate to the ISO Global Clear Sky standard. Other networks do not directly measure PPFD, so it is a critical measurement that AmeriFlux provides to a large scientific community. The DOE-AmeriFlux internal review (Law et al. 2004) and the independent TCCRP report (Running et al. 2005) recommended improvements to the quality of PPFD measurements. We now use a NIST-traceable standard calibration lamp, K&Z PAR-lite sensor and an established methodology that is more comprehensive than preformed by LiCor and Kipp & Zonen (K&Z). K&Z PAR-lite estimates are 2-4% lower than true values, and LiCor estimates are 5-10% below true values. Each year we calibrate ~ 40 individual PAR-lite sensors and ship one to each AmeriFlux research group as a standard to keep in the lab for cross-calibration of field sensors. In December 2007 and 2008, we recalled all AmeriFlux standard PPFD sensors, recalibrated and redistributed them March 2009. All data from the comparisons and annual calibrations will be kept in our data archive to track issues with sensor drift and maintain traceability of measurements. Follow-up correspondence with each research group is ongoing to determine how old calibrations compare with the new in-house standards. We continue to communicate with manufacturers about standardizing PAR calibration because current methods result in unacceptably large discrepancies. Development of Network-level Secondary CO2 standards. We provide secondary standards to AmeriFlux research groups that do not currently use WMO-GMD primary standards. Improperly calibrated gain functions are one of the primary systematic sources of uncertainty. To determine the precision of infrared gas analyzers, sites must use a minimum of two CO2 standards within the range of ambient and with a 10 ppm difference (requires accuracy and precision in CO2 standards less than ±0.5 ppm). The AmeriFlux QA/QC lab makes secondary CO2 standards to within ±0.3 ppm (Li-7000 IRGA), and to within ±0.16 ppm (ESP-1000). Similar to CO2 measurements, differences in network wide H2O measurements show a large range (+/- 15 %) and in latent heat show a strong non-Gaussian distribution, suggesting significant differences in IRGA gain functions (i.e., unaccounted for sensor drift). Eddy covariance estimates of latent heat are subject to calibration error and unaccounted for sources of error due to sensor drift. Real-time, automated, in situ water vapor calibrations are difficult to make because water vapor cannot be delivered to the IRGA under negative pressure, or at the same flow rates as when sampling. We developed a statistical method using a chilled mirror and averaged ambient H2O measurements to provide daily corrections to IRGA gain functions (Loescher, H.W., Hanson, C.V., Ocheltree, T.W., 2009). Similar methods using chilled mirrors are currently used at some sites. For our site comparisons we have decided to perform frequent manual calibrations using LI-610’s that are calibrated against our NIST traceable chilled mirror in the QA/QC lab. This choice was made due to the short and intensive nature of our site visits which allow frequent calibrations and to minimize the cost and complexity of deploying accurate chilled mirrors as part of the PECS. We developed flux measurement guidelines (2005) that meet precision and accuracy requirements of network science objectives. The guidelines include tower placement, eddy covariance flux estimates, profile systems, data acquisition and processing, and calibration procedures. In 2009 the guidelines were updated on the AmeriFlux web site. We also updated the standard operating procedures (SOPs) for calibration of temperature sensors and IRGAs. The new SOPs, ‘Calibration of PAR sensors’ and ‘Secondary CO2 standard mixing and calibration’ were also added to the web in 2009. To enhance the data quality for both meteorological and scalar measurements across the network, we: i) enforce measurement guidelines and use of Gold-file, ii) provide our roving standards of PT100 temperature sensor and CO2 standards to site for in-house comparisons, iii) stress importance of aspirating temperature measurements, and iv) analyze data and present results of a quick comparison at each visited site, and iterate with PIs to correct problems. We continue this approach to address measurement issues with PPFD sensors, incident and net radiation sensors, anemometers and IRGAs. We coordinate activities throughout the network to enhance communication and quality assurance. These activities evolve and now include archive of site visit documents and photos at CDIAC (Oak Ridge National Lab).